With the eleventh hour passage of the American Taxpayer Relief Act of 2012, some might think we have put the fiscal cliff behind us. Unfortunately, this is not the case. While the federal government has temporarily suspended the debt limit until May, without government action the mandatory spending cuts associated with the fiscal cliff will begin in March. With this continued level of uncertainty, it might seem like an unnerving time to remain invested and tempting to try to outguess the market. Investors should keep two important themes in mind. First, they should think twice before assuming they know more than the market already knows about how future events will affect the market. The record is poor for investors who have made this faulty assumption. Recent data points that confirm this are: 1) the historical performance of hedge funds, considered by many to be managed by the best and brightest, and 2) the overall performance of endowments that manage billions of dollars of investable assets. Yet, both generally have been unable to outperform simple low-cost, broadly diversified investment strategies. Over the past 10 years, hedge funds as a group have underperformed the S&P 500 Index by almost 81 percent over a period when the S&P 500 itself did not perform extremely well. Vanguard recently studied the performance of endowments and found that while there have been a handful of very large endowments that have achieved good returns, smaller- and medium-sized endowments (generally endowments with less than $1 billion of assets under management) would have achieved better risk-adjusted returns by using lower-cost, diversified stock and bond strategies. Second, investors should keep in mind that there is a reason stocks have outperformed safer fixed income investments by a large margin over most longer periods of time. They are riskier and that risk encompasses political risk as well as more economically oriented risks. We continue to believe that maintaining a low-cost and well-diversified portfolio that reflects your ability, willingness and need to take risk is the most appropriate way to achieve investment success. There is little in the current environment that warrants changing from that view. The first aggregate limit on U.S. government debt, now commonly referred to as the debt ceiling, was enacted in 1939 when President Franklin D. Roosevelt and Treasury Secretary Henry Morgenthau asked Congress to replace the old system of separate limits on different types of debt with the aggregate limit. Since the limit was enacted, it has been increased or decreased 91 times with the most recent change in late 2011 when it was increased by $2.1 trillion. The issue of whether the government should have a debt limit is a hotly contested topic. A debt limit may in some way help limit spending, but it can lead to substantial financial market uncertainty. Further, some argue that not agreeing to raise the debt limit means the government has essentially decided not to pay expenses that it had previously agreed to incur. For now, regardless of the debate, it looks like the debt limit is here to stay. In 2012, investors watched eagerly for signs that the U.S. recovery was gaining steam. The current expansion, which started in mid-2009, has been deemed the weakest in postwar history. While there was continued weakness in consumer confidence, job growth and real wages in 2012, positive news also surfaced. Throughout the year, this news included healthy corporate earnings and strong balance sheets, continued low inflation, historically low mortgage rates, a strengthening housing market, and upticks in auto sales and manufacturing activity late in the year. In September, the Federal Reserve announced its third round of quantitative easing to push long-term interest rates lower and encourage more borrowing and investment. In September and October, the Bank of Japan announced measures to provide monetary stimulus through 2013 in response to slowing economic activity. Many have credited central banks with boosting investor confidence, and in the case of the European Union, helping avert a euro breakup. The injection of liquidity into the respective economies also helped mute volatility between currencies. Although U.S. economic indicators sent mixed signals, the economy reportedly expanded at a 3.1 percent rate for the third quarter — the fastest pace since late 2011. Mortgage rates reached historical lows, and year-over-year home prices rose for the first time since the beginning of the financial crisis. Despite a steady diet of bad news, most markets around the world climbed the proverbial “wall of worry” to log strong returns. Major market indices around the globe delivered double-digit total returns. All major U.S. market indices were up substantially for 2012. The market’s strong performance came with lower volatility, as gauged by the CBOE Volatility Index, which had its largest annual decrease since 2009. It’s smart to think about how we spend money. But we should be careful that we don’t get carried away in the process. 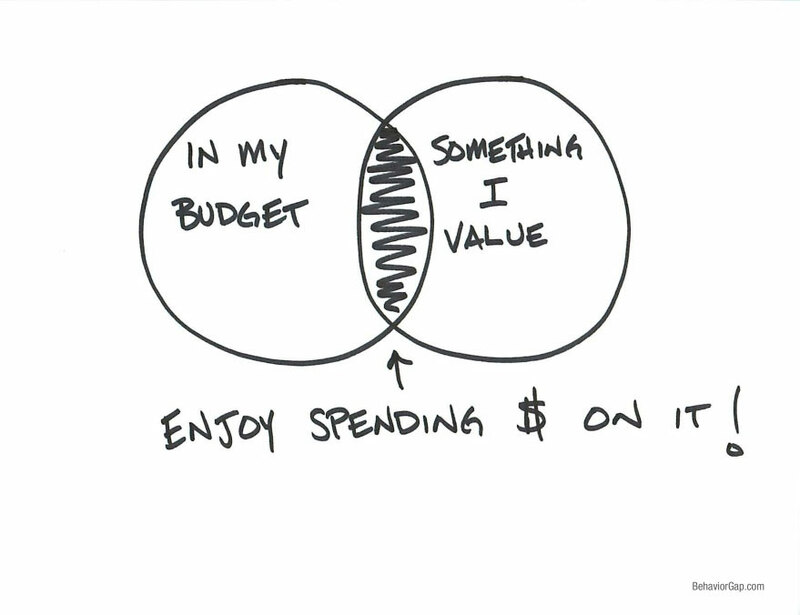 It’s all right to spend money we’ve budgeted on the things we value. This sketch by Carl Richards, author of The Behavior Gap (2012) and director of investor education for the BAM ALLIANCE, was featured last summer on The New York Times’ Bucks blog on NYTimes.com.